This post was updated at 11:27 a.m. to reflect that different times for the collision have been reported. A 22 year old Chicago bicyclist was critically injured last night by driver who left-crossed him at the intersection of North Milwaukee Avenue and West Addison Street, according to CBS 2 Chicago. The driver was cited by police for failing to yield to the bicyclist. The driver of the Chevrolet Suburban was driving northwest on Milwaukee at around 9:45 p.m. (The Chicago Tribune reports that the crash was at 11:30 p.m.) when he or she turned left, crashing into the male cyclist. The man was rushed from the scene to Advocate Illinois Masonic Medical Center, a level 1 trauma center. His present condition has not been reported. A "left cross" occurs when a motorist turns left into a bicyclist who is riding in the opposite direction. Under Illinois law and Chicago ordinance, the bicyclist has the right of way in this circumstance just as a motorist would. It is one of the most common types of crashes occurring between cyclists and drivers in an urban setting. It may not take much to injure that gelatinous cauliflower inside your cranium. Suffering even mild trauma to your head can begin a process that leads to years of muddled thinking, spotty memory and poor focus, among other things. That was the message delivered and received at a conference on traumatic brain injury that I attended last week in San Francisco, hosted by the North American Brain Injury Society. I am not going to jump up and down, telling bicyclists to wear helmets. That is a choice to be left to the individual. On the one hand, the medical profession believes that helmet use will reduce the risk of serious head injury. On the other, helmets may do a better job of protecting against some kinds of injuries more than others. Also, laws requiring helmet use may reduce the rate of bicycle use. So, wear a helmet, or do not. 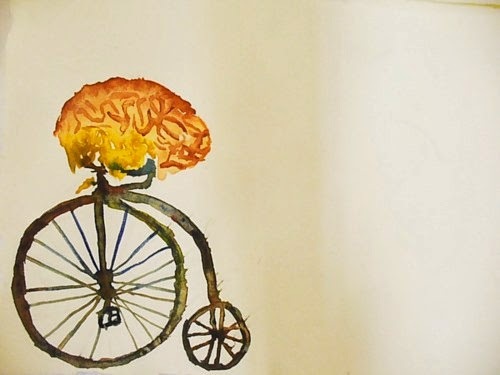 Brain injuries can and do happen to cyclists with and without helmets. A traumatic brain injury is a disease process that begins with an event, i.e., an impact, a skull fracture, a cut or laceration. Having your head whacked may begin a long term condition that never goes away, and may indeed get worse over time. Often, the severity of the brain injury is measured by the size of the whack, the degree of impact, the amount of blood. This is wrong. The severity of the injury is to be measured by the effect it has on the injured person's life over time. Sometimes a seemingly minor whack can have profound consequences. These consequences may include problems with attention and concentration, poor memory, problems with initiating a task, problems with organization, difficulty stopping a particular behavior, increased anxiety, mood changes and problems with impulse control. There may also be an increased risk of Alzheimer's type dementia and/or earlier onset of age related dementia. One need not lose consciousness or suffer intracranial bleeding to have sustained a brain injury. The damage is often at the microscopic level that cannot been seen on CT or MRI scans. It is enough, that there was an incident, an impact, and symptoms. Once concern has been raised by the presence of symptoms, specialized medical testing can be run to determine if there is indeed a traumatic brain injury, or what is termed neurocognitive disorder due to traumatic brain injury in the latest edition of The Diagnostic and Statistical Manuel of Mental Disorders (DSM-5). This is done by having a properly trained expert run neuropsychological testing. This battery of tests is designed to run the test taker through a series of tasks used to measure particular functions that are know to be linked to a particular brain structure or pathway. If testing reveals a problem with a particular function then that is powerful evidence of damage to a specific area or area(s) within the brain. Specialized radiological testing can also be done to uncover additional objective findings of brain injury. Diffusion tensor imaging (DTI), sometimes also called diffusion MRI, looks at microscopic details about the brain's tissue architecture to highlight areas of injury. These tests are very helpful in assisting physicians and psychologists to determine where the brain has been harmed and how. If you are involved in a crash it is important for you and those close to you to pay attention for possible signs and symptoms of a significant brain injury. Some 15 years ago the first case I ever tried involved a mild traumatic brain injury. The defense in that case asserted that because my client looked fine and sounded fine he was fine. It was only after speaking to the people who new him best, his wife and children, who discribed disconcerting changes in the man's behavior since the incident that we worried that the injury was more severe than initially thought. We had neuropsychologists test him and learned that he indeed sustained a major brain injury. Do not hesitate to follow up with your physician if you are continuing to have problems even several months following a crash. He or she may decide to refer you for testing to determine whether you have a brain injury. Today is the perfect day to voice concerns to the City over how it has maintained (or not) Chicago's bike lanes over the winter. From 3:00 to 4:30 this afternoon the Mayor's Bicycle Advisory Council (MBAC) will meet at City Hall to discuss the state of all things bicycle. The meeting is open to the general public and will take place in Room 1103, 121 North LaSalle Street. MBAC meetings are held four times a year and provide an excellent opportunity to hear about the latest bikey happenings and to discuss issues with actual policy makers. There is much to discuss about how the City has dealt with a difficult winter season. Judging solely by appearances, the City seems to have largely thrown in the towel when it comes to maintaining our (no longer) shiny new bicycle infrastructure. 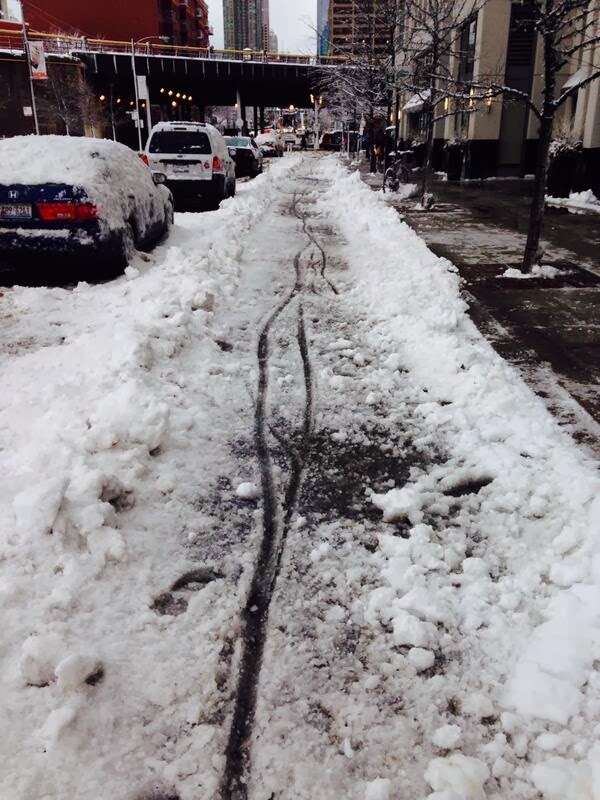 Our bike lanes, particularly our protected bike lanes, are in terrible shape. Plastic posts meant to separate bikes from cars have in numerous instances been ripped from the asphalt, often by the City's own snow plows. Potholes, are not merely an annoyance but are so deep and prevalent in areas designated for bike traffic that they are down right dangerous. In the Kinzie protected bicycle lane there is a sewer cover that has recessed deeply into the ground so as to present a hazard to cyclists using what was once a gleaming example of where the we wanted to go as a city. Someone placed a orange safety cone in it some weeks ago. It now lays mashed in the hole, a limp symbol of our present sad state. Many cyclists were forced to abandon the lane and ride on the sidewalk. It was accurately worse than it looks and it looked bad for the lane's entire length through the Loop. In the case of Dearborn, the City does not seem to have attempted snow removal. Also, the situation was made worse by building property managers along the route pushing snow directly into the bike lane. (I'm looking at you Monadnock Building.) This has been a problem all winter long and the City is quite aware of it. After snow storms Chicago police should be patrolling Dearborn handing out tickets to those dumping snow in the bike lane. My guess is that the City's response to many of these concerns will be that, you know, this was an exceptionally bad winter. It was. But the weather was certainly not unprecedented. No one should be surprised when a Chicago winter is cold and snowy. Perfection is not expected, but the current state of affairs is unacceptable and worrisome. 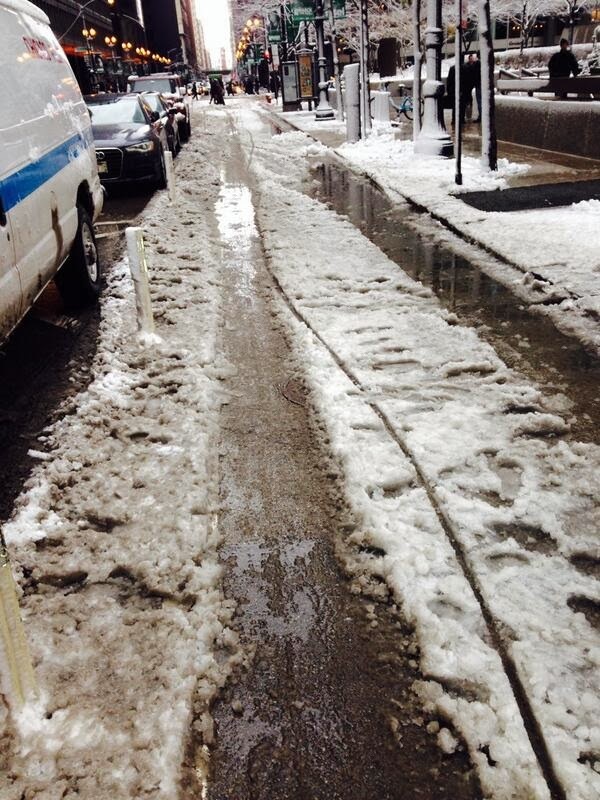 Is Chicago truly committed to making cycling safe and accessible for people "8 to 80" year 'round, or not? If it is, then hard work and planning is required. If you share the concerns raised here, or have additional concerns, show up today and make yourself heard. I know, the winter is nearly over and everyone is sick to death of thinking about snow and the removal thereof. But the time is now to start making sure that next winter the City does a better job of making our bike lanes safe for everyone to use. A lawsuit recently filed against the Chicago Transit Authority alleges that one of its bus drivers ran a red light at the intersection of West Lawrence Avenue and West Central Avenue and struck a woman on a bicycle. 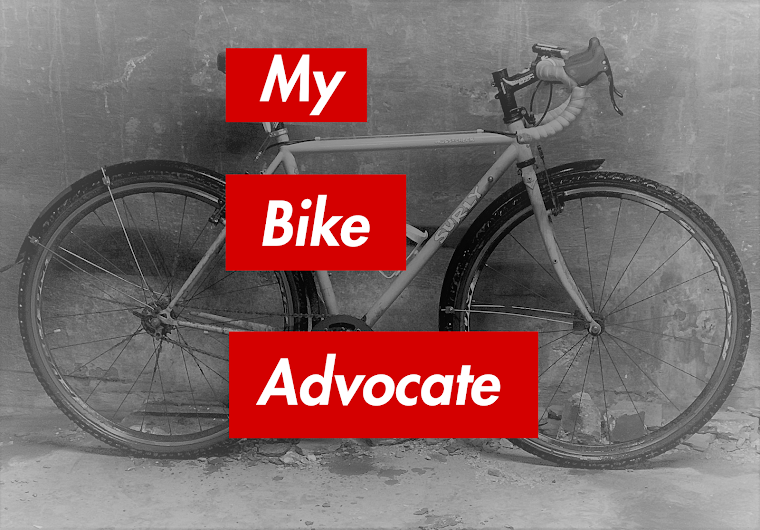 Our law firm filed the suit on the cyclist's behalf on February 18th. The crash occurred at around 1:30 p.m. on October 5, 2013. The 22 year old woman was attempting a left turn from Central onto Lawrence when the northbound bus struck her. The heavy impact caused her head to strike and break the bus windshield. She was taken from the scene via ambulance to Advocate Illinois Masonic Medical Center. There she was kept overnight and treated for injuries to her head and pelvis. An off duty Chicago police officer happened to witness the incident. He said that the southbound cyclist was stopped in the intersection waiting for northbound traffic to clear so she could make a left turn. The Illinois Vehicle Code permits bicyclists to execute left turns in this way, just like a motor vehicle driver. The light controlling northbound traffic turned red, and the bicyclist began her turn. As she turned, the bus driver ran the light and crashed into the cyclist's right side. A video taken from inside the bus demonstrates that the bus did not stop as it came into the intersection. The off duty officer, who had been stopped at the traffic light facing west on Lawrence, stopped the bus driver who seemed, he said, that she was prepared to leave the scene. He also came to the aid of the injured cyclist. The driver was ticketed by police at the scene for failing to obey a traffic control device.